Andy Sullivan from ELST as been in touch with dates for this years two day wilderness first aid courses. I refreshed my first aid skills on this course last summer and actually needed to use them in a real life emergency the very week after. So you never know when you are going to need it and it is something you really need to do if you spend anytime in remote or difficult to get to locations. Even if you don’t, everyone should have these basic skills. You can read my report in the July 16 news letter. Vist their website at www.elst.co.uk for more information. SWOG members will get a 20% discount, put in the code SWOG999 when you book online or mention SWOG when you contact them. At Emergency Life Support Team (www.elst.co.uk), we teach a wide variety of survival and First Aid courses. One of the most popular of these is the Wilderness First Aid Course, which has variations run over 1, 2 or 3 days. Unlike most other First Aid courses, this is not classroom-based, but set outdoors, in the same environment that you’re likely to encounter emergency situations. 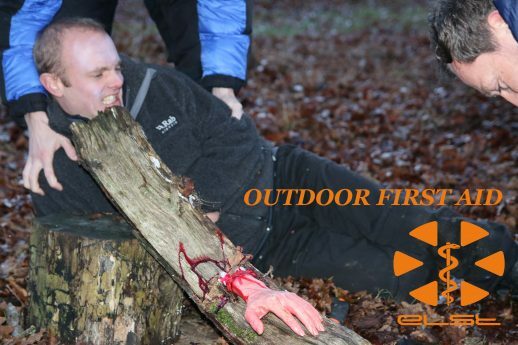 Throughout the course, we use realistic casualty make up to create lifelike scenarios that you may well encounter in a woodland/outdoor environment. Learning some basic First Aid skills can and does save people’s lives. In the ideal situation, an ambulance will be on scene within 8 minutes for a life-threatening call. However, especially in a remote location, this can sometimes take longer to arrive. A blocked airway can kill in 3-4 minutes, yet, using very straightforward techniques, you can keep an airway open until the ambulance arrives. Our courses teach you skills such as this, together with techniques to deal with emergencies such as bleeds, fractures, burns, heart attacks, and much more. These skills are equally important in both the home and the outdoor environment, and are taught in a casual, fun and informative way.